What's long been touted as the American hierarchy's "marriage made in heaven" has come to pass. After weeks of speculation, it's finally official: this morning, Pope Benedict named Archbishop Timothy Dolan of Milwaukee to the archbishopric of New York -- Stateside Catholicism's most prominent post, the chief pastorate of what the Vatican considers to be the "Capital of the World." Soon to become the tenth occupant of 452 Madison, the appointee -- seen as the "natural choice" for the slot from as far back as 2001 -- succeeds Cardinal Edward Egan, whose resignation was accepted for reasons of age. Head of the 2 million-member Gotham church since 2000, Egan reached the retirement age of 75 in April 2007. 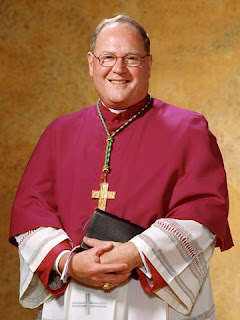 Dolan, who turned 59 earlier this month, was promoted to Milwaukee in June 2002, less than a year after his ordination as a bishop. As reported last evening, the appointee's first public appearance is expected to come at an 8am Mass alongside Egan in St Patrick's Cathedral, with the customary press conference to follow at midmorning. Best known for his contagious, energetic enthusiasm, love for priesthood -- and, of course, media-savvy -- Dolan will be installed as head of the nation's second-largest local church on Easter Wednesday, 15 April, in the nation's best-known house of worship. Founded in 1808 and elevated to an archdiocese in 1850, the transition of governance from one living ordinary of New York to his successor is without precedent. The last time a Gotham archbishop was named without any prior experience in the local church's ranks came in 1939, when the newly-elected Pope Pius XII tapped his close friend, then-Boston auxiliary Francis Spellman, for the post. "Have We Mourned Like This Before?"